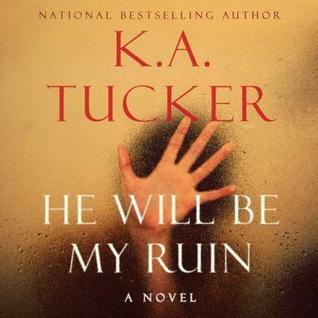 He Will Be My Ruin was my first K.A. Tucker book and I loved it! Since I had never read any previous books of Tucker's, I didn't really know what to expect. While reading the novel, I quickly realized I've been seriously missing out on a great author! I love picking up books just based on the author and I know I will be doing that from now on with Tucker's books. He Will Be My Ruin was fast paced with incredibly interesting characters. I became attached to several of them and wanted them to be my friends in real life! I also loved how the plot was incredibly detailed and complex. Tucker forced me to constantly question the innocence of even the most trustworthy and unlikely characters. I loved that characteristic and I often find its difficult to truly pull off, but Tucker accomplished it well. I am so grateful that the folks over at Atria books included me on the book tour for this novel. I thoroughly enjoyed it and would recommend it to lovers of suspense and thriller novels. He Will Be My Ruin was clever and filled with twists that I never saw coming, leaving me constantly guessing and questioning everyone. It is a must read!